Don't be fooled by the boyish good looks. Total Criminals. At every school there has always existed the expanse separating the cool kids from the losers. The dividing wall constructed from perfect DNA and wealthy parents, segregating the Rob Lowes and Tom Cruises of the world from the pond scum. I was wedged firmly in the latter camp, with nary a chance of ever migrating to the former. 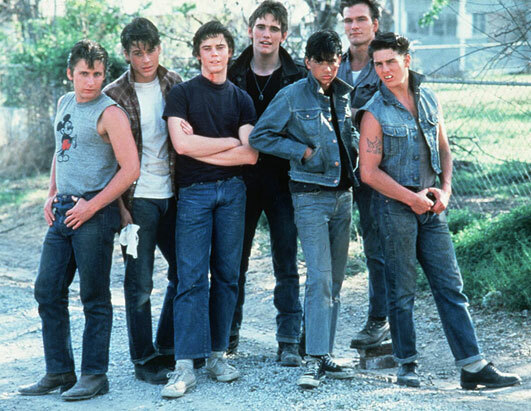 When I was a youngster, the coolest guys in High School were Jonathan and Robert. They were also the scariest, having the means but thankfully not the motivation, to kill you, since you were invisible to them. 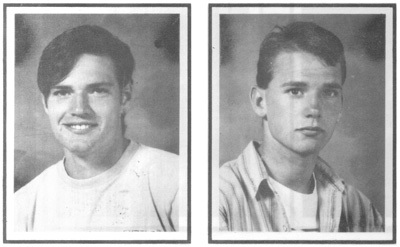 They were brothers, maybe a year apart, by my hazy recollection, which also puts them around middle-age when they finished high school. Both lived sordid lives of crime and never spoke to us, and we never spoke to them. Or looked at them. Or complained from the bright light when we emerged from the basement with their lunch each day. They were even tougher than John, who only ever had cold showers, even in winter at Candelaria and borrowed all his jeans from Axl Rose, who desperately needs to buy a vowel, if he’s ever invited on Wheel of Fortune. Robert wore an LA Raiders college jacket (in the days before they were disowned and moved to Oakland) and walked with a slight limp. Word on the street was it was from jumping into a pool from a 7th floor balcony and landing on the concrete instead. He popped his femur back inside his thigh and walked away fine, other than the limp. He could also throw farther than anyone I knew. Baseballs, babies, those little blue Mazdas that old ladies buy… you name it. He beat everyone at ball throw every year for our field days and smashed some neighbour’s window 3 miles down the street with the softball once. Their prayers were answered when we scratched Javelin from the competition. Luis once told me in confidence that he heard first-hand from his uncle’s cousin’s sister’s nephew that Robert threw someone through a car windscreen once with his bare hands. This of course, was a perfect example of rumours and exaggeration about Robert. It was Jonathan. And the windscreen didn’t break: just the guy’s collarbone. Jonathan once got busted at school in a fight, (during which he was “flying the friendly skies” as Snoop Dogg would say), by one of the teachers who was an ex-cop from L.A. It sounds a lot worse than it was; it was probably Anaheim or something. Anyway, Jonathan took an ‘indefinite holiday’ from school for 5 months, during which at one point, while figuratively and quite literally flying the friendly skies again, he jumped from a 3rd-floor window, presumably under intense pressure from the pursuing police to stop before they opened fire. The resulting broken arm and 5 month-long concussion meant his SAT results looked a little like the prices on the gas station sign. He did, however, return to school afterwards, completely transformed and joined the school’s mission trip. So there you go. [note: insert redemptive story here and sell the rights to the Hallmark Channel] On a rare occasion when the brothers were actually on school grounds for once and not terrorising competing cartels, once again at Axl’s fashion prompting, they started a bandana craze which meant all of a sudden everyone at school was wearing bandanas. Robert’s bandana was completely blood-stained, not from exacting vengeance with his forehead, but because it had spent the previous 3 months holding his leg together. Even us nerdy kids got in on the Bandana act, which didn’t really work, because honestly, with the pale skin and gaunt frames, we looked like a pre-pubescent chemotherapy support group. I tried started several fads of my own growing up, including socks & sandals, and trying to look extremely impoverished because all I owned was 2nd-hand, neither of which helped me climb the social ladder. The bandana craze of ’91 went against some kind of bizarre school belief that bandanas promoted gang behaviour, and like the modified semi-automatic Glocks of ’89 before them, were promptly banned. Most of us were allowed to keep our shivs and brass knuckles for playground safety. There were other notable characters and underworld figures I looked up to at school, like James, John’s brother, who I looked up to through swollen eye-lids, flashing a toothless grin, after he’d tripped me over as I ran back to the swings with a glass bottle of Fanta. It wasn’t so bad that the glass smashed, piercing my spleen and filling the gaping hole in my abdomen with orange bubbles; rather that I was running on cobblestone at the time, which turned my face to porridge. He was apologetic and promised not to stab me if I told no one, saying the same to the available witnesses, who promptly vanished. John of course, was above hurting people, insisting instead on damaging himself, as we covered here previously. At any one time, there were also about a dozen Rodrigo’s attending the school, although again, none of them ever noticed me. One Rodrigo used the office phone to call his Mum once. She was in Miami at the time. That was probably the sum-total of the school’s tough kids. My friends and I certainly worked hard to keep the natural order in balance. I think Jonathan may have even glanced in my general direction once, so he soared past, into the concrete below. *Given the mildly criminalistic activities mentioned in this tale, I have to give a huge thanks to Jonathan, who gave me permission to let this go live, unedited and not embellished in any way. He promised me Robert would approve too, and would love reading a printed copy in his cell when the light was right. Posted in Bolivia, Characters, SchoolTagged Axl Rose, LA Raiders Jacket, people that can kill you, Wheel of FortuneBookmark the permalink. with my own eyes, I’d never have believed it possible! Either my memory isn’t what it used to be, or maybe it was Ardin who was racking up those friendly skies frequent flyer miles!!!! Looking past the colorful narrative, and having being classmates with both Jonathan and Robert, I can vouch for the adventurous spirit shared by the brothers… I really do miss those guys!!! Ardin I laughed so hard when I read this. You are a very good story teller.